Covered in green, spiny bumps, the Jackfruit is the world’s largest tree fruit and grows directly out of the trunk or branches. As the fruit ripens, the exterior turns yellow and brown, becomes fragrant, and yields slightly to pressure. Sweet and fragrant yellow pods have hints of mango, banana, and melon. 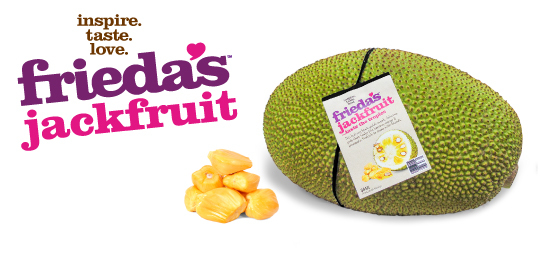 NPR called Jackfruit “the ginormous fruit to feed the world” for its versatility. Perfect size for sharing with friends! Throw a jackfruit party. into wedges. 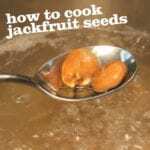 Using paring knife or your fingers, separate the pods from the “silk,” then remove seeds. Reserve seeds if using. Refrigerate cut fruits. A source of vitamin C and supplies potassium and protein. The color may vary from green to brownish, but you’ll know the jackfruit is ripe and ready when you press on the fruit and it has some give. The fruit should also be fragrant. If still hard and on the green side, leave on counter to ripen. Wrap cut fruit tightly in plastic and store flesh in container. Refrigerate up to 7 days and freeze for up to 2 months.